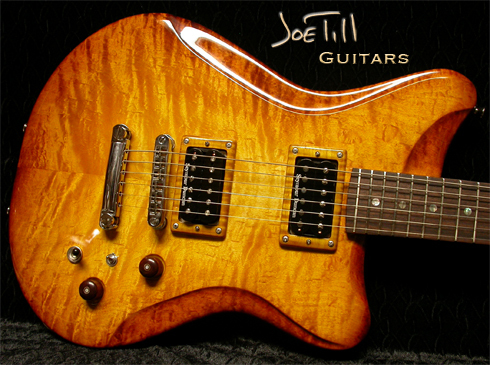 Joe Till Guitars are handmade in California, USA. Joe's three major concerns are tone, playability and beauty. He won't let a guitar out of his shop without high marks in each category. You're welcome to choose from my "Private Stock" of guitars found on my "Currently Available Guitars" page, or you can order a custom guitar from scratch. I currently offer two guitar models and one bass model, each of which can be modified endlessly to suit your needs. Joe can build Setnecks, Bolt-on necks and Neck-through-body styles. Pickup configurations are limited only to the body space available. You can pick the woods, hardware and colors. You can send your guitar ideas to Joe Till Guitars and they will give you an exact price. TillGuitars.com will showcase their new models and monthly specials.